It's pretty easy to do, too! 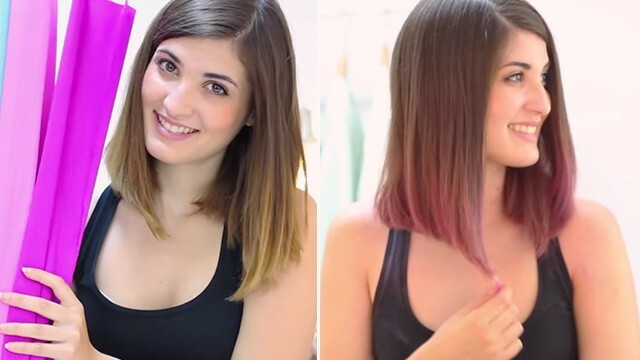 Here’s a hair hack we just discovered: you can dye your hair with crepe paper! It sounds crazy, but apparently, people have been doing it for a while now and it actually works. You’ll only need crepe paper, warm water, a bowl, and gloves. Instructions say to cut the folded crepe paper into strips and then soak them in hot water. Wrap sections of your hair with the wet strips—and take them out after 30-40 minutes. Wash your newly-colored hair with conditioner. This dye job will cost about P20, while the color will last about 7-10 days, depending on how you take care of your mane. Are you willing to try this hair hack?